My freezers are getting filled with the summer harvest from the garden. I’ve been adding freshly blanched peas, broccoli, beet greens and cabbage rolls for us to enjoy during the coming winter months. Unfortunately, some of those new items have been piled on top of older vegetable baggies, miscellaneous meats and unlabeled 😳 packages of leftovers, causing my freezer space to over flow. I started tackling this food abundance issue last week by using up frozen food items for our daily meals (with a side of fresh garden salad). 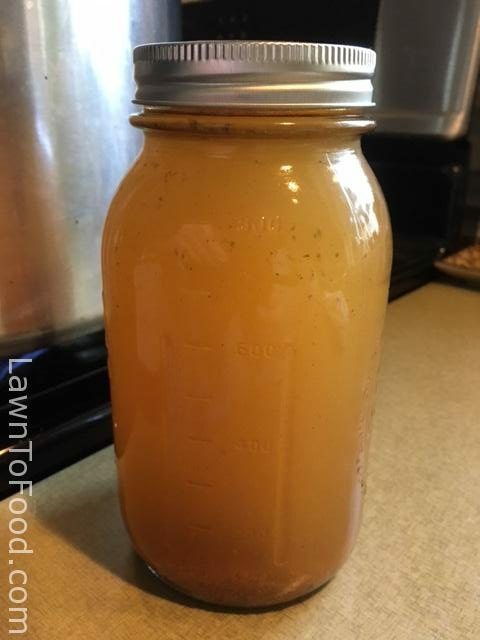 A few days later, I still had a lot of food that needed to be used up, or composted, so I decided to make a stock. I brought out my large stock pot and started completely clearing out the kitchen freezer for a defrost and wash. I added items to the stock pot that I felt would go well together to build a flavourful broth. There were bones from our side of pork, a chunk of roast beef, some ham bones, and vegetable medley packages from last summer. A baggie of sliced ginger (that was on sale during the winter, but turned out to be very fibrous). Some chicken bones (that I have been waiting to burn in the fireplace), garlic scapes, beet greens, and frozen tomatoes. Now that the freezer was empty and defrosting, with the saveable items safely stored in my other freezer, I turned to the fridge. There, I found more items to add to my brew. On the fridge side doors, I found several condiment bottles that had small amounts left in them; Frank’s Hot Sauce, ketchup, soy sauce, rice vinegar, mint sauce, olive brine and on the top shelf some lemon-ginger jelly. In the produce drawers, I grabbed some jalapeños that were soft (but not moldy), dried up green onions, and two overripe peaches which were also added to the pot. I covered the stock pot ingredients with water and set it on the back burner to simmer. Now, I was ready to clean my freezer and fridge. After simmering for 3 hours, I tasted the stock and it was delicious! Similar to an Asian broth that is used for noodles or wonton. I strained off all of the bones and vegetables to let the stock cool. Once it was cool, I was able to remove, and discard, the fats and oils that had settled on the top. I sorted through the dregs, removing some stringy meat and vegetables for our dogs to enjoy. 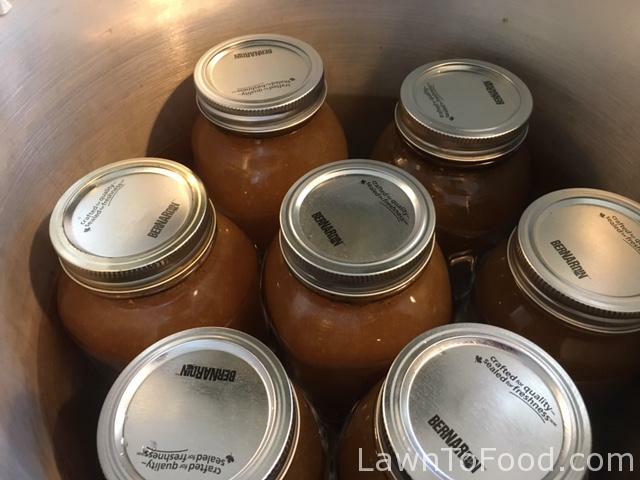 The beautiful stock that remained was reheated and then poured into seven quart jars. That’s a lot of stock produced from food that could have been tossed out! I left 3/4″ of head space in the jars, wiped the rims to remove any debris then put on a new lid and a rust-free screw band. I pressure canned the 1L jars at 10 pounds of pressure for 25 minutes as per Bernardin instructions.